Today I took my parents into Vancouver. Dad had a specialist appointment first thing Monday morning. With the traffic and constant road construction, we have found it easiest to head into the city the night before and stay at a hotel. This is by far the least stressful way of dealing with travel to the city. 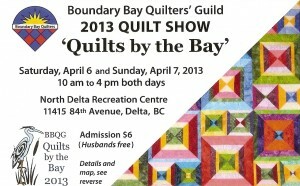 On the way into Vancouver, we stopped in Delta at the Boundary Bay Quilters’ Guild show. 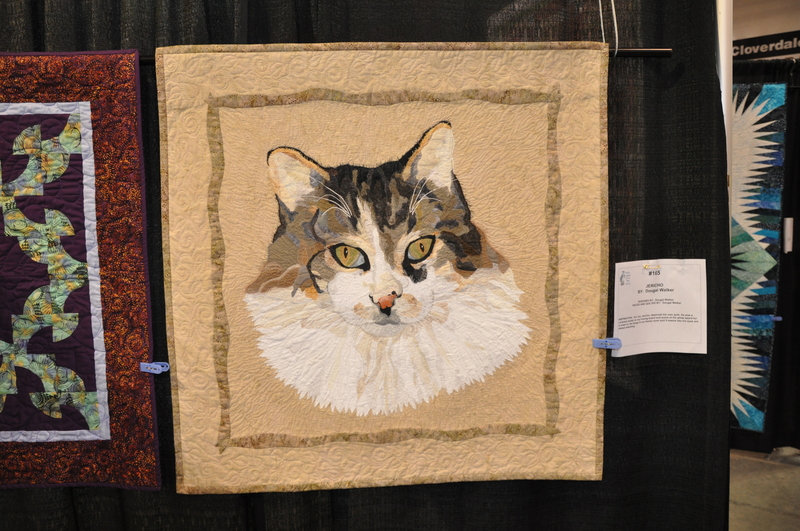 This cat quilt was my favorite quilt of the show. 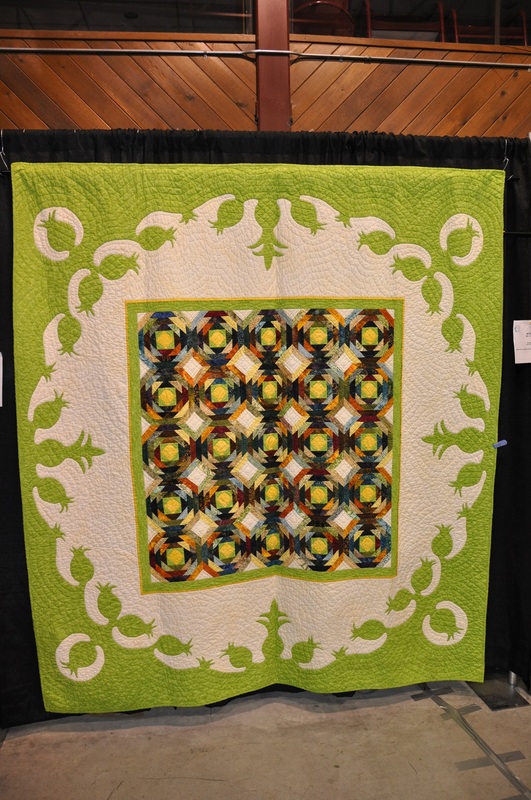 This lime green Hawaiian themed quilt was my second favorite. 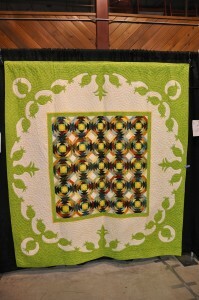 I love the mix of traditional Hawaiian applique on the border and the pieced pineapple blocks in the center. There was a huge display of bags and purses. I am always looking for new bag ideas. 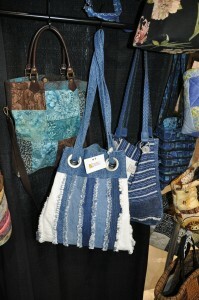 This grommet bag made from recycled blue jeans. These table centers were favorites of my Mom’s. The guild had these on the tables in their tea room. Does anyone know what this pattern is called? There were lots of vendors at this show. I bought a cute little pieced chicken quilt kit. Stay tuned for pictures of that one. 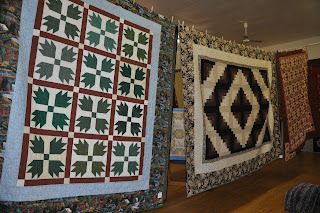 This weekend was our local guild’s quilt show. Set up was Friday. We opened Friday night from 5 pm to 9 pm. This was the first year that we opened our show up to the public on Friday night. Saturday we were open from 9 am to 4 pm. This was the view as you came in the door of the church. This was our raffle quilt. This was the first year that we sold all of the tickets that we had printed. This is our guild banner. We had a small merchants’ mall as well. And now….on with the show! I spent all day Saturday demoing crumb and string quilting. 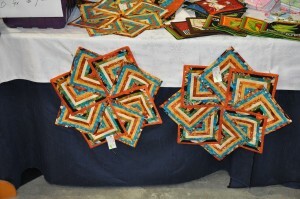 This was my table – set up in front of one of my quilts, Got Stripes that was entered in the show. 1.) 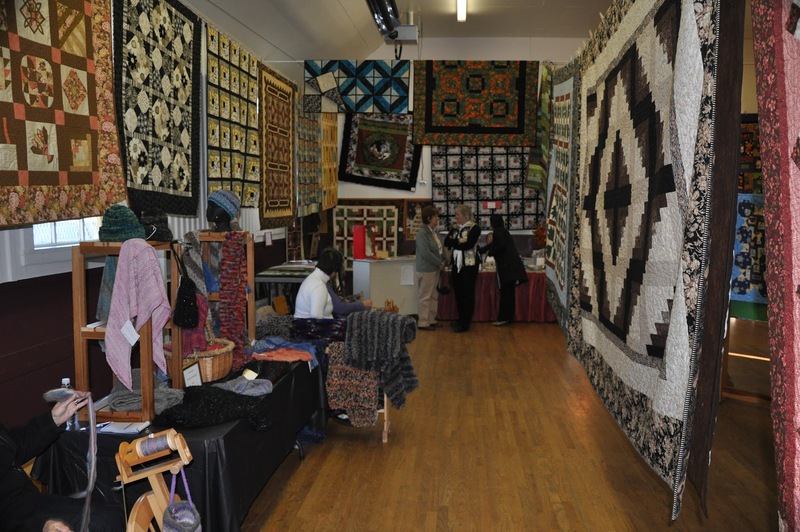 I entered a total of 14 quilts in this show. Got Stripes is 99.5″ x 115.5″. 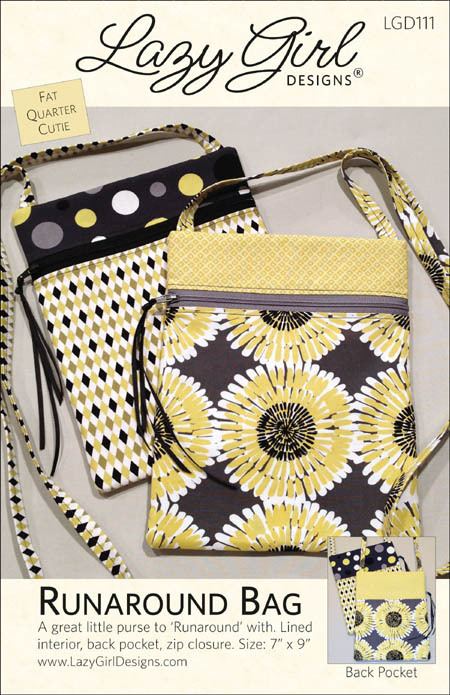 The Pattern is by Terry Atkinson from Terry’s Time Out Quilts book. This quilt is part of a collection of quilts gifted to my daughter and her husband on the occasion of their wedding on September 1, 2012. This was the display that I looked at as I demoed on Saturday. This display was also in my field of vision as I worked away at my demo table. 2.) This is where my quilt, Love Is was hanging. A closeup of Love Is. This quilt is 37.5″ x 49.5″. 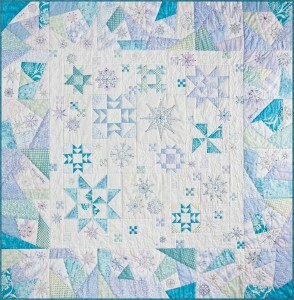 This pattern is by Paula Stoddard and was on her blog, Quilt Happy, Quilt Often, at one time. This quilt was presented to my daughter at her bridal shower in August. 3.) 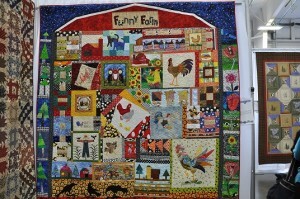 This is another one of my quilts–Minnesota Hot Dish. 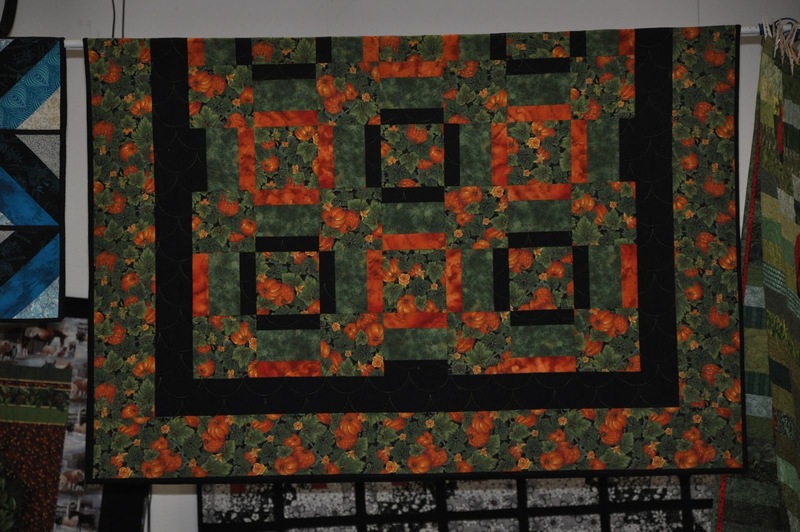 This quilt is 86″ x 101″. 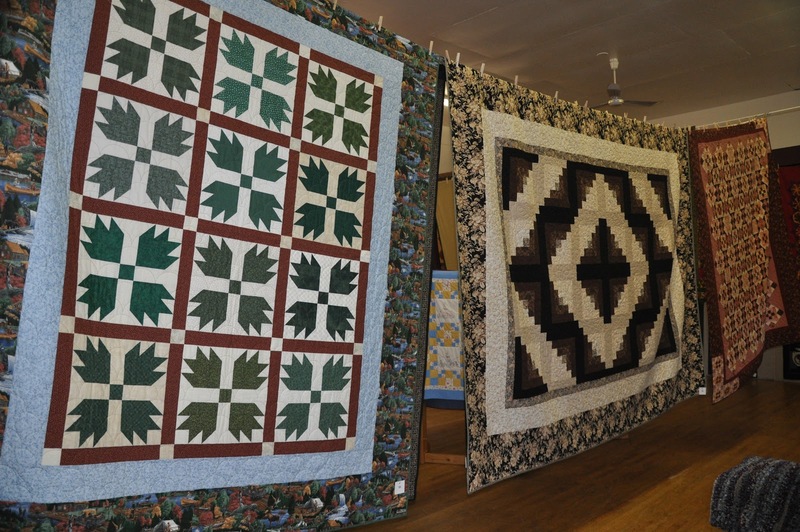 The pattern is by Terry Atkinson and is also part of a collection of quilts presented to my daughter and her husband at their wedding on September 1, 2012. 4.) 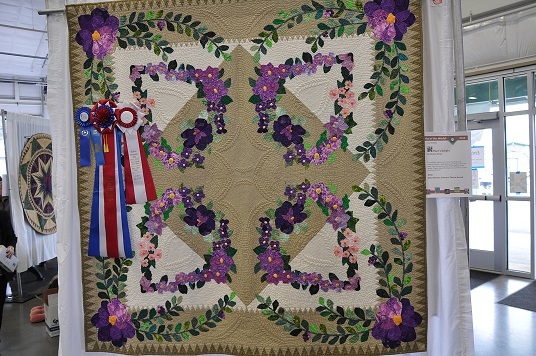 This is another of my quilts, Butterfly Trails. This quilt is 64″ x 77″. The pattern is by Atkinson Designs and is from Terry’s book, Time Out Quilts. This quilt is part of the collection of quilts that was presented to my daughter and her husband on their Wedding Day. 5.) This is where Bento Box hung at the show. Bento Box was the fifth quilt that I entered in this show and is 61″ x 75″. 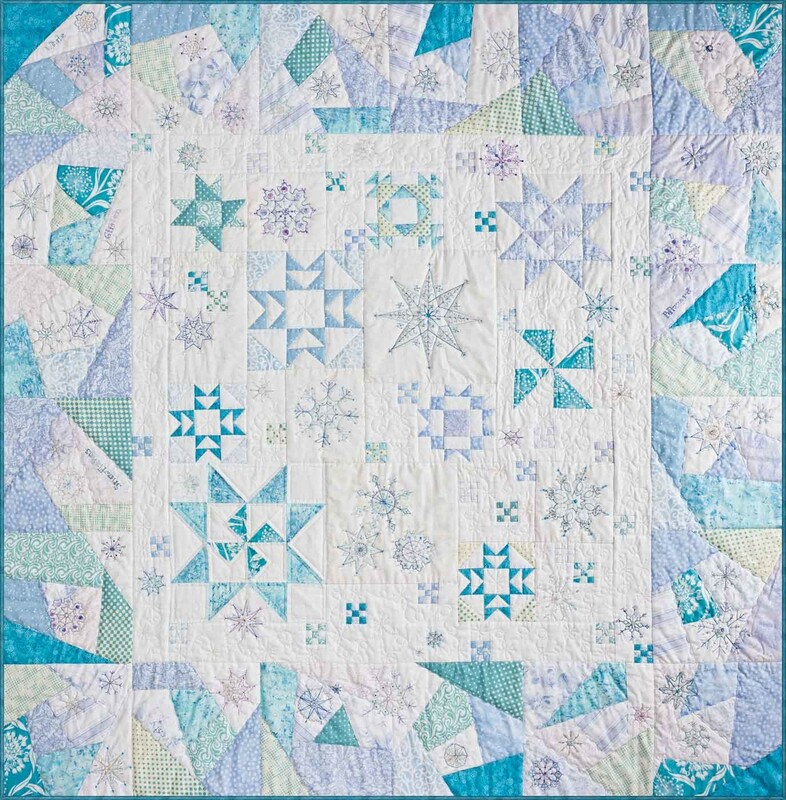 This pattern is by Tracy Brooksheir. 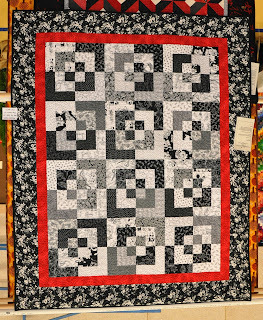 This quilt also forms part of the collection of quilts that were presented to my daughter at her bridal shower. 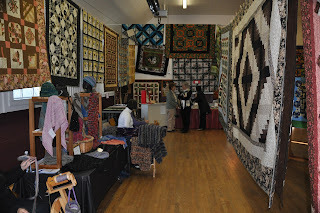 This picture shows the long row of quilts that hung on the far wall of the hall. Two of my quilts are visible in this picture – Pansies and Fire Escape. 6.) Pansies is 51.5″ x 68″. The pattern is by Kari Nichols. This quilt forms part of the collection of quilts that were gifted to my daughter at her bridal shower. 7.) This is Fire Escape. This quilt is 59.5″ x 71″. This quilt was presented to my daughter at her bridal shower. 8.) This is where my Jelly Roll 1600 quilt hung at the show. This is a closeup of JR1600. 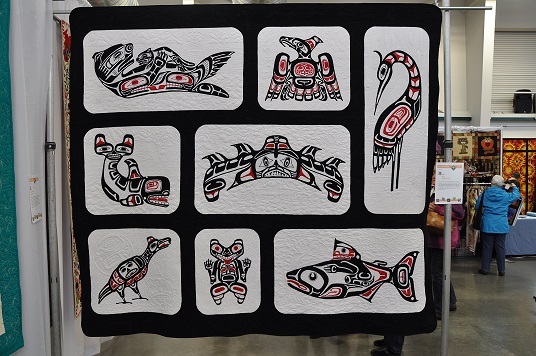 This quilt is 47.5″ x 62″. This quilt still belongs to me! The pattern for this quilt can be found on You Tube. 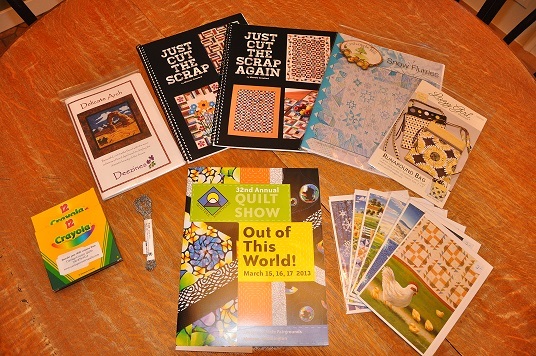 The online quilting group that I belong to–the FABs–celebrated each quilter’s birthday in 2011 with an online birthday party. This quilt was assembled during Pam’s birthday party. After the presents were opened, we were on to the rest of the party. Pam and Cher used commercial Jelly Rolls and Linda, Pat, and I used strips cut from our own stash. After joining 40 – 2.5″ strips end to end you have 1,600 inches of fabric. Take the end of your strip and match it with the beginning of your strip and put the pedal to the metal and sew! You will be working on one long seam–800 inches long. You repeat this 5 times and you end up with a lap sized quilt. There is to be no pressing of seams until the top is done. The women on the video claimed to be making their tops in 35 minutes. It took longer than 35 minutes for me to complete my first seam! After sewing my top together I thought my top needed something more. All the green fabrics looked like a lawn to me so I thought about adding some bugs. 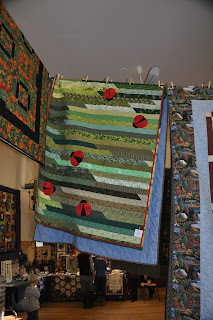 After the quilting was finished, I appliqued the 5 ladybugs to the top–one ladybug for each FAB. 9.) This is a wall hanging that I made from a panel. I called this one, Love. (Not very original, eh?) The pattern that I used was Sidelights by Kari Nichols. This one finished 46″ x 53″. 10.) 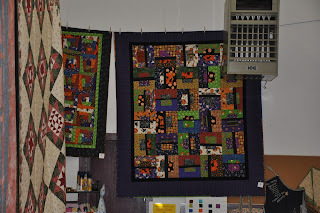 This is where my quilt, Halloween Scrappy Log Cabin hung at the show. 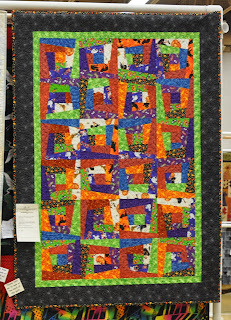 Halloween Scrappy Log Cabin is from a pattern by Two Kwik Quilters and finished 47.5″ x 66.5″. This was a pattern that many of us from our Monday night quilt group have made. 11.) 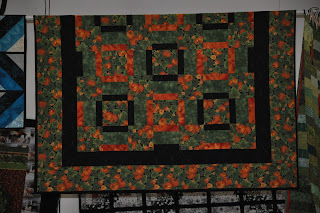 This is the quilt that I finished recently–Fall Rail Fence. 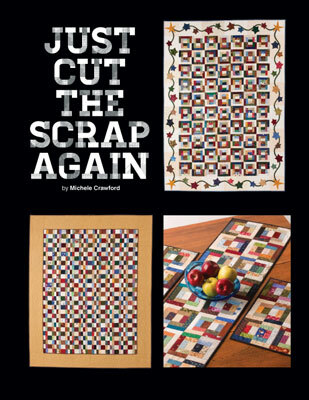 This quilt finished at 68″ x 86″ and was inspired by a quilt on the cover of the January 1999 issue of Traditional Quilter. 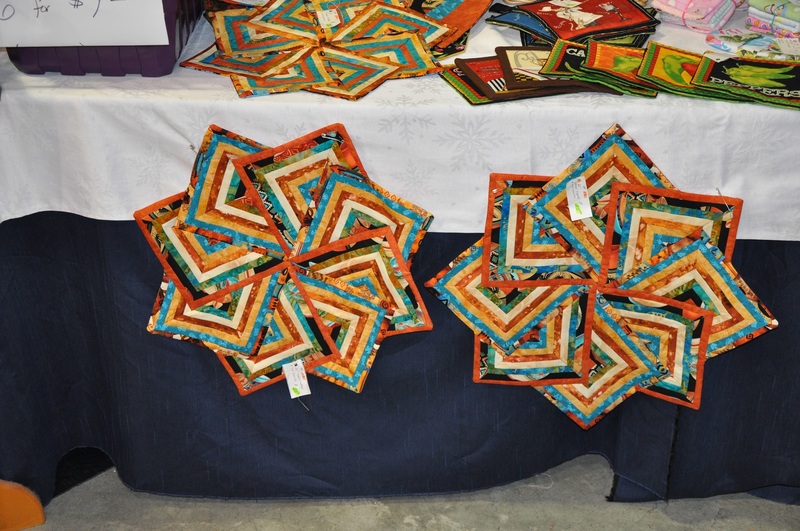 The quilt in the magazine was called, Christmas Village and had a border of foundation pieced houses and trees on it. I started this quilt in 1999 and by the time I got around to finishing it recently, I decided that I no longer liked the border that was on the quilt in the pattern so I replace the pieced border with this green/sunflower print. 12.) 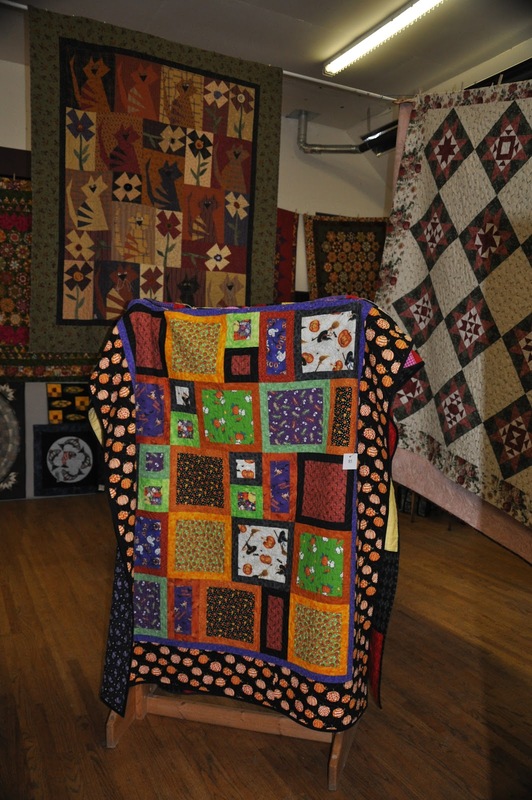 This quilt literally came right off our bed before it was hung in the show. 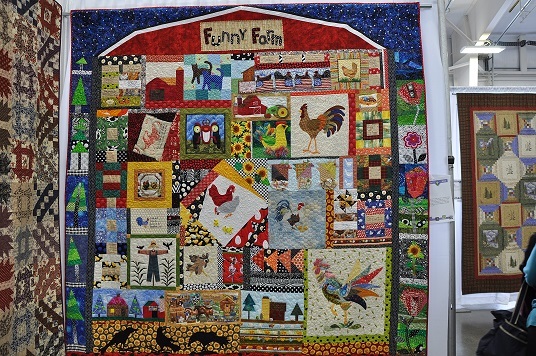 This quilt is 95.5″ x 103.5″ and is called, Rooster Twist. 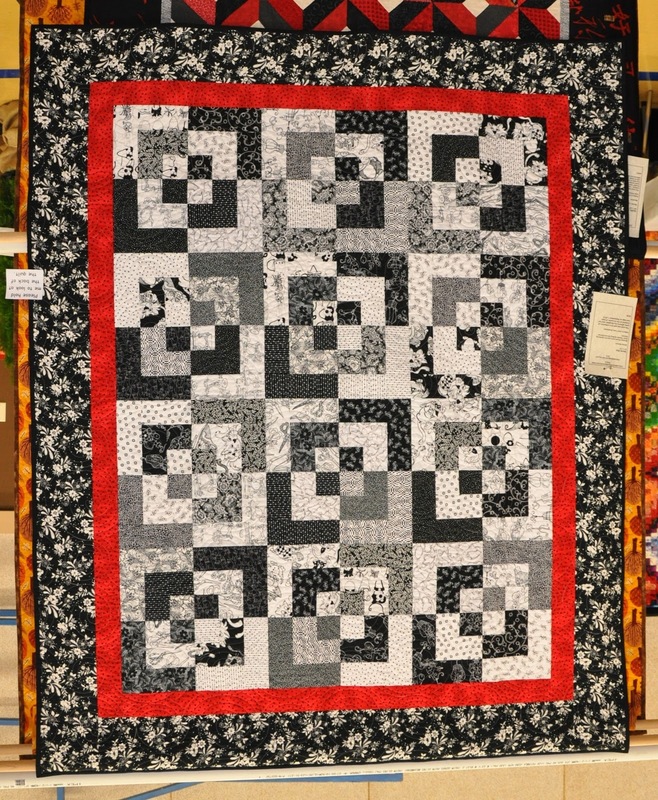 The name of the quilt pattern is Strip Twist and is by G.E. Designs. 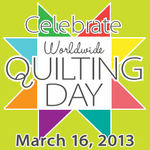 I belong to a group of on-line quilters called the FABs. One member is from Wisconsin, two members are from Oregon, another member is from Alabama, and then there is myself. Although we had quilted together on line since 2006, only a few of us had met in person before we got together for a retreat in 2009. We had a great time–each of us piecing together our own version of this quilt. Friendships were bonded together forever that weekend and we continue to quilt together most weekends thanks to MSN and e-mails. 13.) 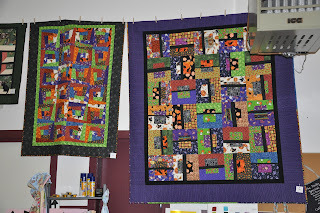 This is a small version–61.5″ x 72.5″–of a larger bed size quilt that I made, All About Halloween. This is another Terry Atkinson pattern–All About Me. 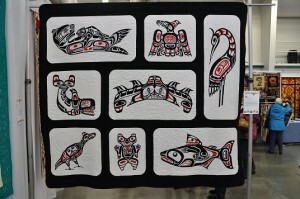 This quilt was gifted to my son and his wife after the quilt show. 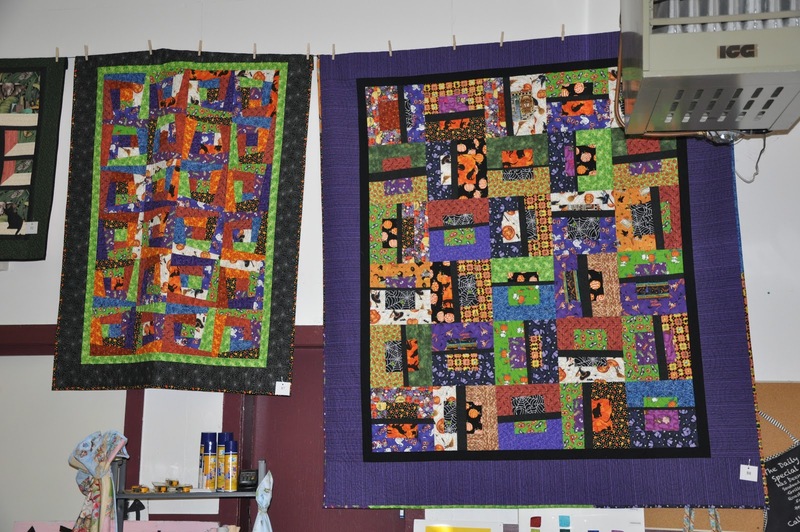 This quilt was a healthy alternative to trick or treat candy this year. 14.) 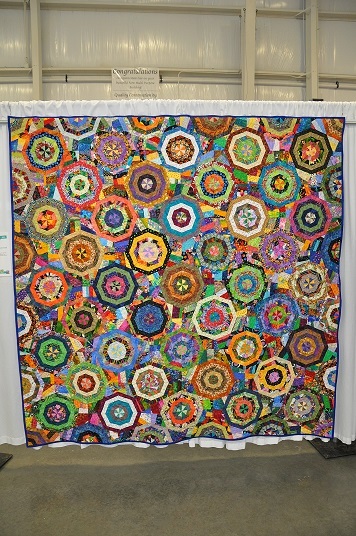 This is the last quilt that I entered in our quilt show this year. This quilt is Halloween contemporized Country Squares and measures 73″ x 85″. 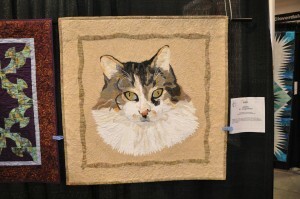 This pattern is by The Stitchery in Olds, Alberta. 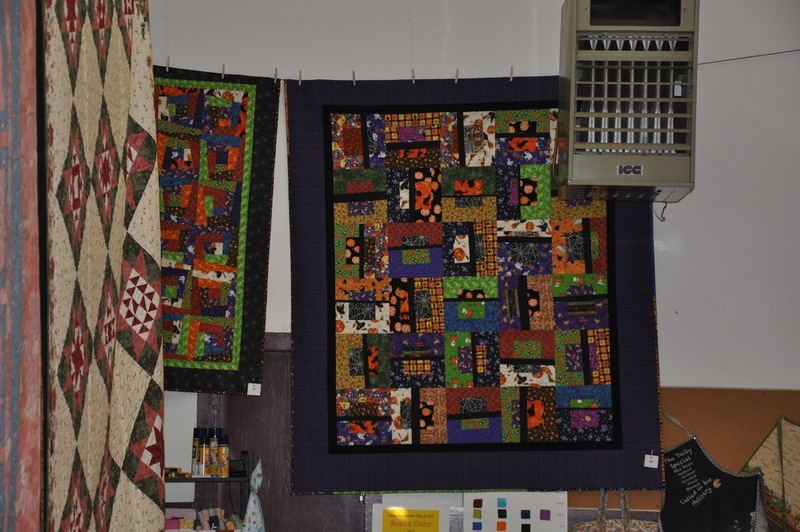 While attending a family reunion near Olds, Alberta in August 2010, I had an opportunity to visit a local quilt shop called The Stichery. I fell in love with the samples of this quilt that they had hanging in the shop and purchased my own copy of the pattern from the mother/daughter team that designed the pattern. This pattern was perfect for my Halloween scrap collection. This quilt was gifted to my daughter and her husband after the quilt show and was a healthyy alternative to trick or treat candy. This is a picture of one of the fresh flower arrangements that decorated the tea room tables. By the end of the show, I was exhausted. It is always a lot of work to put on a show like this. However, it is all worth it when you receive the positive comments from the public like we did. See you all in another two years! 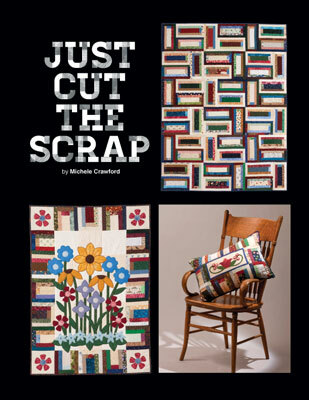 I had 4 quilts hanging in this show: Christmas Bargello, Rooster Twist, Harold’s Fish Quilt, and All About Halloween.